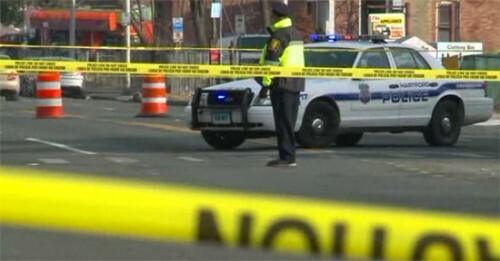 According to Fox News, Hartford Ct, police officers at a fatal car crash in Hartford, CT on Feb 1, 2014 saw a quadcopter with camera flying over the car crash. Apparently bodies were still in the cars. The pilot of the quadcopter was questioned by police, but not arrested. The police report says the victim’s bodies were not visible to the quadcopter. The FAA has launched an investigation into the matter, but as yet has made no comment. “HARTFORD, Conn. (AP) — A journalist filed a lawsuit Tuesday alleging that Hartford police officers violated his free-speech rights by questioning his use of a remote-controlled aircraft to record images of a car wreck. Pedro Rivera asked a federal court to weigh in on the appropriate uses for aerial drones as policymakers try to catch up with technology that has made them far more versatile. His complaint says that officers demanded that Rivera stop flying the remote-controlled aircraft, asked him to leave the area and told his employer that he had interfered with a police investigation. The lawsuit, which was filed in U.S. District Court against the Hartford Police Department, seeks damages for Rivera but also asks the court to declare that he did not break any laws by operating the 2 1/2-pound, four-rotor aircraft above the scene of the fatal Feb. 1 wreck. It says that Rivera made clear he was not working for the television station, WFSB-TV, although he acknowledged that he occasionally sent the video feed from his drone to the station. “The suit is as much about trying to make sure police officers don’t legislate from the beat as it is about getting a court to weigh in and say what the standards are,” said Norm Pattis, the attorney for Rivera. Rivera, 29, of Hartford, argues in the lawsuit that police violated his First Amendment right to free expression as well as his Fourth Amendment right to be free from unreasonable seizures. Although his device was hovering at an altitude of 150 feet, he said he was operating in public space and observing events that were in plain view. Lt. Brian Foley, a Hartford police spokesman who is named as a defendant in the suit, said he could not comment on pending litigation. Foley said earlier this month that police questioned Rivera but said officers did not ask him to ground the drone. At the time, he said the only concerns for police were for the safety of the officers and the privacy of the victim, whose body was left hanging out of a mangled car. The Federal Aviation Administration, which is investigating Rivera’s use of an aerial drone, has discouraged their use for commercial purposes, including journalism. A law passed by Congress two years ago requires the FAA to integrate unmanned aircraft of all sizes into the domestic airspace by late 2015, but it’s clear the agency won’t meet that deadline. The FAA has been working for more than four years on regulations to permit small drones — those weighing less than 55 pounds — to be used for commercial purposes, but it repeatedly has missed deadlines for proposing those regulations.